This is the time of the year when it is lovely again to observe the changing season. As the winter's cold and dark months are over the days start to lengthen and you get the first flowers coming up. 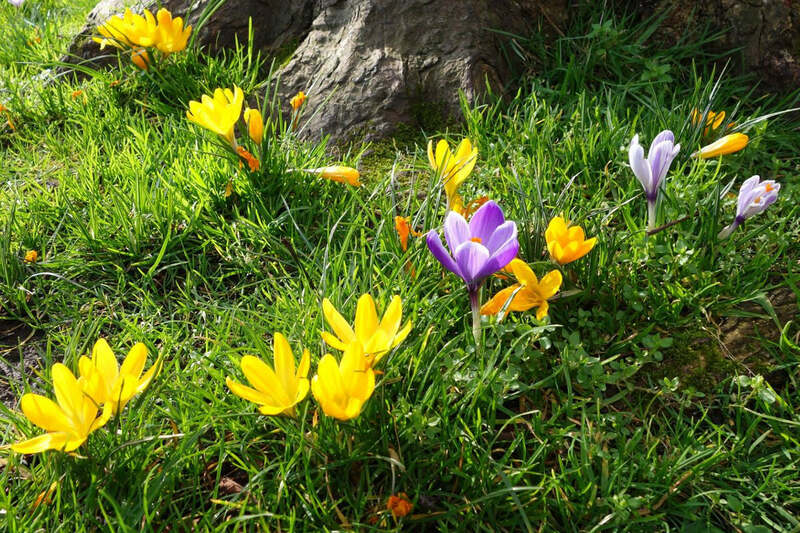 Blow away the winter cobwebs by searching for one of the first signs of nature's reawakening: the wild and early garden flowers. Get your walking boots on and go for a walk to the nearest park, field or forest and look through the skeleton branches of the sleeping woodland to discover them, the colorful messengers of spring: daffodils, snowdrops, crocuses, primulas, muscaris and scented hyacinths. While they are dancing delicately in the light breeze under the trees, on the empty soil or in the middle of the lawn they show up their natural uncomplicated beauty. They paint a welcoming picture of spring and this is what I do love most about it: the hopefulness. Once discovered can't fail to inspire a smile. Potted bulbs starting to open their flowers are everywhere in shops at this time of the year. You don't need to spend much to bring spring's wonder into your home. Have a relaxed afternoon and plant them into a nice ceramic bowl, an old baking thin or if you want something cute just plant them into old china tea cups. They will bring a bit of happiness of March into your home wherever you place them. As time goes on days start to get warmer and warmer we are pleased with the real show time! One of nature's finest moments is the magical springtime performance of blooming trees. Throughout the season there is always a beautiful blossom to appreciate near you. Naked magnolia trees are wrapping themselves into white creamy, yellow, pink or purple petals. Buds and leafs are appearing. Camellias are waving at you and for the call of sunshine and birdsong of course fruit trees are enchanting you with their fairy tale blossoms. Warm April weather brings cherry blossoms with. Although one of the most famous flower watch is in Japan you still can join to a "hanami" picnic at the nearest arboretum and enjoy the mind-boggling riot of marshmallow pinks and whites. The best place to spot flowering pear, plum, apricot and apple trees is in kitchen gardens at historic houses. Spend a sunny day discovering a secret garden of a mansion and visit a nice place where you can enjoy nature's awakening form the long and frozen dream of winter. You can also go for a May foraging and pick wild garlic or some elders. You can't miss their unique smell. But never chose a busy roadside to pick them and if you are not sure thank ask an expert. While wild garlic is a perfect herb for cheering up Sunday roast, elder blossom makes delicious and refreshing cordial. Enjoy the season and make the most of every moment of life in spring.